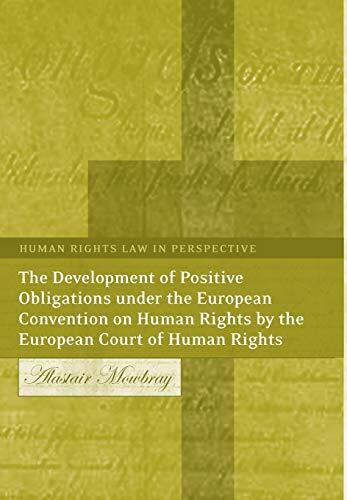 [PDF] The Development of Positive Obligations under the European Convention on Human Rights by the European Court of Human Rights (Human Rights Law in Perspective) | Free eBooks Download - EBOOKEE! Description: During the last thirty years the European Court of Human Rights has been developing, at an expanding pace, positive obligations under the European Convention. This monograph provides a critical analysis of the burgeoning case law concerning positive obligations, a topic which is relatively uncharted in the existing literature. Positive obligations require many different forms of action by member states, ranging from effectively investigating killings through to protecting peaceful demonstrators from violent attacks by their opponents. The contemporary significance of these obligations is graphically illustrated by the fact that it is the obligation upon states to provide fair trials to determine civil and criminal proceedings within a reasonable time that is the source of the overwhelming majority of complaints to the European Court in recent years. The study examines the legal bases and content of key positive obligations. Conclusions are then drawn concerning the reasons for the development of these obligations and areas of potential expansion are identified. No comments for "[PDF] The Development of Positive Obligations under the European Convention on Human Rights by the European Court of Human Rights (Human Rights Law in Perspective)".